Welcome to the platform of IndiaCafe24.com. Nikitha share with our readers about your background and family? Thank you so much. I am born and brought up in Bangalore. But my ancestors are from Rajasthan. We are from business community. My dad is a textile merchant and my mom is a housewife. I have two sisters, one elder and one younger. My elder sister is married and is a chartered accountant. She has been role model for me and my cousins. We grew up in a joint family with grandparents, parents, aunts, uncles, siblings and cousins unlike my maternal family. My cousin brother Rahul always felt like my own brother. I was my grandfather’s favorite. 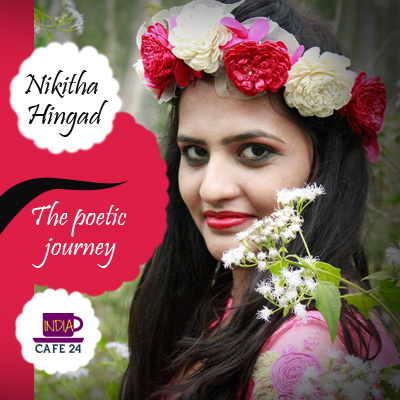 Nikitha, you are a budding poet of India- How was the journey so far for you? It has been truly amazing connecting with poetry readers throughout the globe. I have poems written from 2006-2015 and have added them in Philia and Sophia. You will see the growth of a poet in the book itself. I have been writing and collecting from the time I turned 18. Some of my poems in Philia would not be true love. They are more like teenage crush. I let them be as I find them innocent and cute. But the poems in Sophia are far matured and deep. And these poems are the reason I am able to connect with older generations. From writing poems in sms to compiling into a book was a good experience. Through poetry I reached so many people and I feel I have been lucky to do that. What are the sensitive qualities which you feel need to be there to give birth to a poet? I think being able to empathize and see nuances of life is an important quality. Poets are usually rebel to societal norms and usually followed just to abide laws and rituals. But keeping aside and seeing not only on humanitarian grounds but also as just another living being makes you a deep thinker. Poets are very sensitive to any injustice. And literature needs such writers writing creatively not just to entertain but to enlighten the masses about such injustice. Which genre of poetry attracts you the most and why? It’s the philosophical poetry which attracts me the most. I like work of Kahlil Gibran, Rumi, Kabir and al. These poets attract you mystically. Their verses are like mysterious spells which charm you to decipher their meaning. And every time you read them they have a message and I like that. Whom you consider as an inspiration in your life? When people appreciate your work how you feel? Who is so far your Biggest Critics? My mother is my biggest critic. She is blunt. Like a typical Scorpion she calls an ace “ace”. Sometimes people who love us do not tell the truth because they do not want to hurt us. My mother is different and it has made me brave to face the truth. 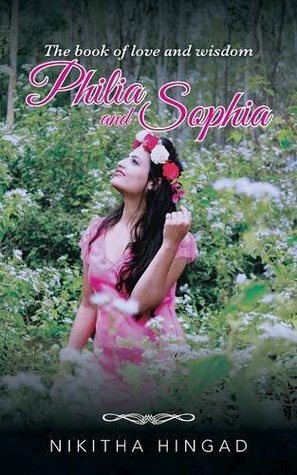 Give us a brief about your debut poetry book Philia and Sophia? How was the experience of finding the publisher for your book? There are few poetry publishers and readers not only in India but also abroad. So I chose Partridge to publish my poetry book. Which poem written by you is your Favorite? Which is your favorite genre of poetry? I am still exploring various forms and genres. But I like wisdom poetry as they are timeless. How the theme behind any poem develops in your mind? My poetry is usually spontaneously written. Non spontaneous ones are inspired by Bollywood songs or spiritual texts. Say something about your life beyond poetry? We want to know about your other passions in life. I have various interests. The only problem with me is that I am too confused and I get bored easily. I like dancing. I like singing too but I am just not good at it LOL. I like sketching too. Recently I have developed interest in cooking. I try various recipes from different cuisines. I have been to cooking classes too. It gives me another creative medium to express. I love accessories and jewelry and I am typical girl minus bitchy and gossiping. I love dogs and I think they are best companions anybody can have. I have a 7 year old female golden retriever. Her name is misty. I also have deep interest in occult sciences. I am into astrology from past ten years. I read a lot and surf too. I have a collection of books. I am a movie buff. I love watching romantic movies like The Notebook, Jab we Met, Namaste London and the pretty woman. I also like comedy movies like Dumb and Dumber, andaz apna apna and all. What next after this book? I continue writing poems and also write short stories now. In one line describe Nikitha Hingad- The poet? Nikitha Hingad is intuitive, sensitive and a deep thinker.